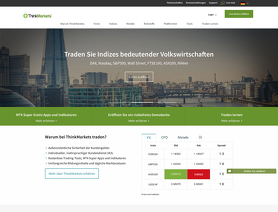 ThinkMarkets is a forex broker. Think Markets offers the MT4 and MT4 Mobile trading currency platforms. ThinkMarkets.com offers over 25 currency pairs, cryptocurrencies, gold, silver, indices, commodities and cfds for your personal investment and trading options. PLEASE BEWARE OF THIS BROKER. THEY ARE A SCAM BROKER. THEY ARE NOT ACTUALLY REGULATED, ITS A FRONT. THEY ARE NOT FCA APPROVED. ONCE YOU REGISTER YOUR TRANSFERRED TO SOME OFFSHORE ACCOUNT WHERE THEY CAN NOT BE TOUCHED IF YOU TRY TO SUE THEM. IVE BEEN WITH THEM FOR 6 MONTHS AND IVE EXPERIENCED THE MOST "SLIPPAGE" EVER. MY ORDER WOULD GET CLOSED OUT BEFORE IT EVEN TOUCHES MY SL. WHEN I ASKED THEM ABOUT IT THEY SAID SOMETHING ABOUT HIGH VOLATILITY AND SLIPPAGE AND IT HAPPENS ALL THE TIME. I DID MY RESEARCH AND FOUND OTHER PEOPLE WERE HAVING THE SAME ISSUE AND LOST ALOT OF MONEY WITH THIS COMPANY. PLEASE DO NOT REGISTER WITH THEM. I REMOVED ALL MY MONEY FROM THEM AND LEFT. YOU WERE WARNED !!! THEY ARE NOT TO BE TRUSTED !!! Super quick withdrawals which is a pleasant change from my other brokers that hold up my withdrawals for all sorts uncomprehendable reasons. I do around 90% of all my trading through Thinkmarkets over two accounts, mostly fx and indices. I do trade some physical stocks and options with IB but Thinkmarkets doesn't offer those. I can be fairly punchy in my trade sizes ( eg 200 lot clips on E/$ ) which not all brokers like, especially the ones who claim to be ECN. The spreads and execution on the markets i trade with Thinkmarkets however are great ( as is the customer service ), mind you I steer clear of trading the news or on rollover - no pro trades then. I have recommended a few trading buddies to Thinkmarkets and will continue to do so. Good spreads and great customer service. My relationship manager is very helpful. POOR CUSTOMER SERVICE FROM STEFAN PASHALIYSKI. worst customer service agent. i am a new customer looking to open an account. spoke to this agent twice. i asked what sort of documents needed. NEVER give me any straight answers. give me different email addresses to email and find out information myself. i came back again a couple of hours later, ask again. said he will email me the details. waited for 3 days. no response. completed my application with the help of another agent. came back a couple of hours to check. unfortunately, spoke to this agent again today. AGAIN, give me a generic response, " wait 24 hours for a email response"
Firstly we want to apologise for your recent experience and delay in processing your account application. We can see your trading account is now active and your account manager will be in contact shortly. We appreciate your feedback and we will take your comments onboard. Fast easy withdrawals. good spreads. well regulated. Fast withdrawals and good execution. cant complain,,,platform always up in news etc. beyond me anyone can complain. They are super. The advantages of thinkmarkets are cheap fees, good customer services and withdrawal, but I had a problem around USA market time, 9:30AM-9:30PM GMT time, 26-Dec-2018 that leads to my loss more than US$100k. After that, I must asked “the live chat” to close all inc. the pending orders, anyway they cannot be triggered by the system. When I email them with all testimonials including chat transcipts, screenshot. They answered: “my orders were rejected due to low liquidity”. I replied: “I couldnot close it due to low liquidity, so why your live chat employee can close it” and still waiting for their feedback. Note: most of my friends also had this situations and lost from 10k-100k at that time. Btw, my accounts are: 10027586 Interceptor, 10027976 (MT4), 10026360 (interceptor), and 10028738 (MT4). And this was happened because the market suddenly changed. Thank you for your message and your feedback. We are currently in the process of reviewing your trade queries from 26th December and will be in contact with your shortly. Still my favorite broker till now . No issues since 2 years. Best support so far. Opened an account to trade stock CFDs, i thought they must have had a promotion on as they do not charge any commissions what so ever for trading stocks. I did contact one of their reps and they confirmed that commission free on stocks was here to stay. It's great, i can trade as little or as much as i want without getting hit with commission tickets and go long or short. For the past month I've been day trading US stocks, the volatility has been great and i can be in and out of trades all the time. They do need to increase the number of stocks they do as it is limited to the big names only. I've also started hedging via their US indexes, still trying to find the perfect strategy! Thank you for your feedback. We have passed on your suggestion regarding increasing the number of stocks offered.